The snap election scheduled to be held in Greece this month after the resignation of Prime Minister Alexis Tsipras offers an appropriate occasion for the presentation of an emblem related to the democratic vote. The chosen image is the device of Lodovico Castelvetro (Modena, c. 1505-Chiavenna, Switzerland, 1571), the influential Renaissance humanist, philologist, and literary critic famous for his vast learning and his various important works. He is especially known for his translation of Aristotle’s Poetics into Italian. His interpretation of this particular work contributed to the development of Neoclassicism and the widespread adoption of a tight version of the Three Unities as a dramatic standard, which helped to set the critical norms for Renaissance and French Neoclassical drama. Lodovico Castelvetro. Archivio Storico – Università di Bologna. The device depicts an owl perched on top of a toppled urn with the Greek inscriptio “KEKPIKA” (Tung, 1110). The image closely resembles the figure on the reverse of the Athenian “New Style” tetradrachm (on this, see Amaral, Jr., 388-390). And, about the above mentioned impresa I will say, by the way, that it originated from his own rivals who, for the sake of mockery, called him Gufo or Barbagianni, whereas, knowing well that the famous people of Athens never interpreted it as shameful but rather as honorable to adopt for their impresa the Owl, who keeps vigil and sees even at night, and as a symbol of Wisdom was for this reason consecrated to Minerva: Castelvetro also believed it was good to turn the otherwise offensive title of Gufo for his usage. Therefore he took it for his impresa, putting it over a vase with a large belly, which, reversed, showed to be void and contained nothing good, with the motto κέκρικα, i.e. I have judged, wishing to signify, so I think, that he, although being considered so vile by his adversary, had demonstrated that such an adversary was nothing more than a vase swollen by excessive self-esteem, empty of wisdom and judgment (Muratori, 70-71; my translation). In Italian, a gufo is a general name for an owl with long ears, and a barbagianni is a barn owl. The words also refer to a misanthrope and a silly person. 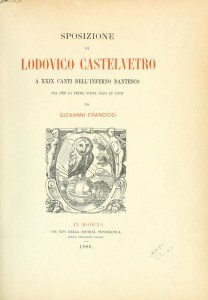 Castelvetro himself, in the chapter “Viltà di Lodovico Castelvetro” of his Ragione, refers extensively to the nickname Gufo and why he would prefer to be called Civetta (a generic name for smaller owls with less negative connotations) instead (Castelvetro, 148v-150r). However, in some versions of the device a few pebbles tumble out of the vase’s mouth as if it were a voting urn pouring out the stones thrown inside it by the voters, a system used in some types of elections in ancient Athens, the birthplace of democracy. In this case, I think the device may be also interpreted in a different sense that applies to events of the present day: the inscriptio “KEKPIKA” means that ballots have been counted and the vote decided for the issue submitted to the judgment of the citizens. … in the Senate of Athens, served to collect the votes of each Senator; when they were ready to discern the votes collected, they turned it out to see if the party was defeated or not in a certain room where the image of the owl was placed above, the bird being attributed or dedicated to Minerva, patroness of that city, as if she were surveying the deliberations and the judgment that was made of men in the common councils of that most noble Republic. Therefore, if an impresa was made according to such feeling, I would say that perhaps there is a desire of properly representing that ancient special usage of the Athenian Senate. And that, due to this, its author could show his previously expressed feeling or his judgment regarding Caro’s song, and give an answer right away to the latter’s Apology issued against such expressed things, although reiterating the judgment in the guise of decision or firm deliberation that he had already pronounced about that song. Nevertheless, if the bird perched on that vase were not a civetta, by my knowledge I do not know where to properly base such a Castelvetroesque understanding. Doubtlessly, I therefore believe that it is all devised as a demonstration of having definitely, through the study of things poetic, judged this Caroesque work defective. This same impresa was placed by its Author before the work made by him as giunta [attachment], as he calls it, to Bembo’s Articuli [Articles] and Verba [Words]; to the one on the corrections to some things of Varchi’s dialogue of languages; and, lastly, to his published exposition of Aristotle’s Poetica; in all these places he shows to aim it equally at the same target: of having hit or expressed his determined judgment (Bargagli, 135-136); my translation). The Civetta or Gufo on a vase or pot of balls upturned in such a way that scattered balls, or broad beans, or lupine beans may be seen, half black and half white, with the motto Kέκρικα, i.e. Judicaui, I have judged, has been equated, although awkwardly, with the saying Decretvm est, which belonged to Castelvetro, alluding to what was done and is still done nowadays in judging with small balls; more appropriate would have been Ivdicivm signat, or similar, which would have been closer in form to the Impresa (Ferro, II, 139-140; my translation). 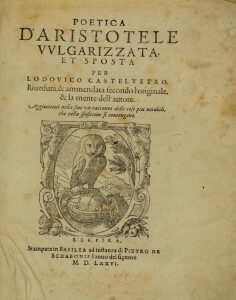 This device, in all of its various forms, was printed on the frontispiece of the following editions of Castelvetro’s works: Poetica d’Aristotele vvlgarizzata et sposta (Vienna: Gaspar Stainhofer, 1570, and Basel: Pietro de Sedabonis, 1576); Ragioni d’alcune cose segnate nella canzone di messer Annibal Caro, Venite all’ombra de gran Gigli d’oro (Modena: Cornelio Gadaldino, 1559, Venice: Andrea Arrivabene, 1560, and Parma: Seth Viotti, 1573); Giunta fatta al Ragionamento degli articoli et de verbi di Messer Pietro Bembo (Modena: Heredi di Cornelio Gadaldino, 1562); Correttione d’alcune cose del Dialogo delle lingve di Benedetto Varchi, et vna giunta al primo libro delle Prose di M. Pietro Bembo, dove si raggiona della vulgar lingva (Basel, 1572); Le Rime del Petrarca breuemente sposte (Basel: Pietro Sedabonis, 1582, and Venice: Antonio Zatta, 1756); and Sposizione di Lodovico Castelvetro à XXIX canti dell’Inferno Dantesco ora per la prima volta data in luce da Giovanni Franciosi (Modena: Società Tipografica, 1886). The author’s name is not mentioned in the Ragione. According to Monica Bianco, the use of an impresa in place of a name in this book was advisable due to the fact that Castelvetro’s life as a fugitive had already begun and would continue until his death. On December 20, 1556, he was sentenced to beheading and confiscation of his possessions for the murder of Alberico Longo, and in 1560 the Holy Office condemned him for heresy due to his involvement in Lutheranism (Bianco, note 3). Longo was a close friend of Annibale Caro. Longo’s death is attributed to a long and fierce literary quarrel that started when Castelvetro harshly criticized Caro’s poetic work Venite all’ombra de gran gigli d’oro, written in praise of the Farnese family and the royal house of France, that motivated a quarrel between Caro and Castelvetro. Many important intellectuals participated in this dispute, including Benedetto Varchi and Ludovico Muratori on opposite sides. Apologia degli Accademici di Banchi di Roma (Parma: 1558) was produced in support of Caro, to which Castelvetro immediately answered with the Ragione. The American bibliographer Thomas Randolph Adams (1921-2008), who was librarian of the John Carter Brown Library and John Hay Professor of Bibliography and University Bibliographer at Brown University, also adopted the pictura of Castelvetro’s device for his personal ex libris. Amaral Jr., Rubem: ‘Does Strength to Wisdom Give Place? An Iconographic Critical Approach to Emblem 96 in Thomas Palmer’s Two Hundred Poosees’, Emblematica, 21 (2014), pp. 381-395. Bargagli, Scipione: Dell’imprese di Scipion Bargagli gentilh’vomo sanese. Alla prima Parte, la Second, e la Terza nuovamente aggiunte: Dove; doppo tutte l’opere cosi scritte a penna, como stampate, ch’egli potuto ha leggendo vedere di coloro, che della materia dell’Imprese hanno parlato; della vera natura di quelle si ragiona, Venice: Francesco de’ Franceschi Senese, 1594. Bianco, Monica: ‘Lodovico Castelvetro e la ‘intitolatione gratiosa de’ libri a spetial persona’’, Margini, Giornale della dedica e altro, 2, 2008. <http://www.margini.unibas.ch/web/rivista/numero_2/saggi/articolo3/castelvetro.html> consulted in 08.21.2015. Castelvetro, Lodovico, Ragione d’alcvne cose segnate nella canzone d’Annibal Caro Venite a l’ombra de gran Gigli d’oro, Venice: Andrea Arrivabene, 1560. Ferro, Giovanni, Teatro d’Imprese di Giovanni Ferro, Venice: 1623. Muratori, Lodovico Antonio: Opere varie critiche di Lodovico Castelvetro Gentiluomo modenese non più stampate, colla vita dell’autore scritta da Sig. Proposto Lodovico Antonio Muratori bibliotecario del Ser.mo Sig. Duca di Modena, Bern: Pietro Foppens, 1727. Tung, Mason: Impresa Index To the Collections of Paradin, Giovio, Simeoni, Pittoni, Ruscelli, Contile, Camilli, Capaccio, Bargagli, and Typotius, New York: AMS Press, 2006. As you all noticed, this month we took longer to publish our Emblem of the Month. As a reward, however, here we have another great contribution from Rubem Amaral, and we will get back on track with an excellent piece by Valérie Hayaert. I would like to thank Jennifer Craig for her work revising articles for this section. I wish to thank all those who make possible this section of the website of the SES , both with their research contributions and editors. These “little pills” cheer us on.